When is tree trimming season? The answer is now. Now is the time for tree trimming season as we move into spring. After a long winter, spring is the time for new life and rejuvenation with plants and trees. It’s time to get outside and work on your home’s most noticeable feature, the yard. Almost have of a tree service company’s business comes from tree trimming requests. Let’s take a look at why it is so important. Some homeowners request tree trimming for cosmetic reasons. They may have a look in mind for their landscaping and trimming the trees can help them achieve that. Sometimes it’s a few limbs that make the difference in a clean yard or a gnarly one. Cleaning up your tree tops can actually add some much needed light to your grounds. It also helps the life of the tree. Pruning dead tree limbs will help the tree grow and stay healthy. And that’s what you want, healthy trees. Dead tree limbs don’t serve a purpose. They set the stage for potential danger when hanging over your home, car or fence. This is especially true if your tree hangs over your neighbor’s property. You wouldn’t want to pay for property damage if a dead tree limb falls from your tree onto your neighbor’s car. Well would you? Probably not. 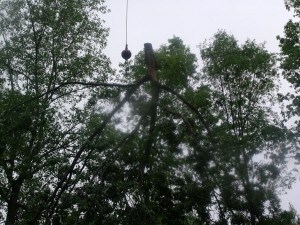 It’s a cost you can avoid by investing in tree trimming services. Calling on your local and trusted tree service company is the safe way to go as they know when and where to cut as well as when to stop cutting. Now is the time to evaluate your landscaping to find the areas that need fixing. Tree trimming or complete tree removal could not only freshen up your landscaping it could also save you some costs down the road. For full tree services, call on the team of experts at Sharp Tree Service. Let’s get ready for spring together!